Signing Hands Across the Water was a festival for everyone to enjoy, celebrate and explore sign language poetry. Now that it is over, we can briefly look back on what happened over those three busy days. We all learned and shared. The poets taught us so much, and in doing so they learned from each other. We will all take away a changed view of signed poetry. On Friday evening, the poets came together before an audience of over 100 Swarthmore and other Tri-Co students and Faculty, members of the deaf community and visitors from the wider community. The poets introduced themselves one by one and performed one short poem each so we could get an idea of their work and what we might expect over the next few days. For many people in the audience this was their first experience of signed poetry. Then the poets talked about sign language poetry and its role in the Deaf communities in England and America – sharing their ideas with each other and allowing the audience to look in on the conversation through the fourth wall. Their discussion was a balance of funny and serious, and they provided a fascinating mix of interesting facts, opinions and tales of their own experiences. They talked about the ways that poetry and deaf community life in England, Sweden and America have similarities and differences, and they talked about poetry as an education tool, a cultural reality and something that can be thought of through language and through art. They touched on the relationship between English and signed poetry – a topic that became a thread that ran through the festival. Saturday morning saw 30 members of the Deaf community gather to learn and develop their sign language poetry skills from the six deaf poets leading the festival. Each poet brought a task to the workshop, helping participants compose, refine and even perform their poems in some cases. By 4pm there were 11 poems on camera and many more in the participants’ heads and hearts. On Saturday afternoon, while deaf community members were composing and exploring poetry ‘hands on’, Kenny Lerner ran a workshop to consider ways that signed poetry can be accompanied by spoken English. He introduced several possible methods, including providing occasional English prompts to guide non-signers through the passage of a signed poem, speaking almost word for word translations of the signed poems and speaking an English version of the poem as the signed poem unfolds, even where words and signs are very different. He illustrated his session with performances by Flying Words, Dorothy Miles and Ella Mae Lentz. With so many guests from the Deaf community for the performance on Saturday night, Upper Tarble became a ‘Deaf space’. 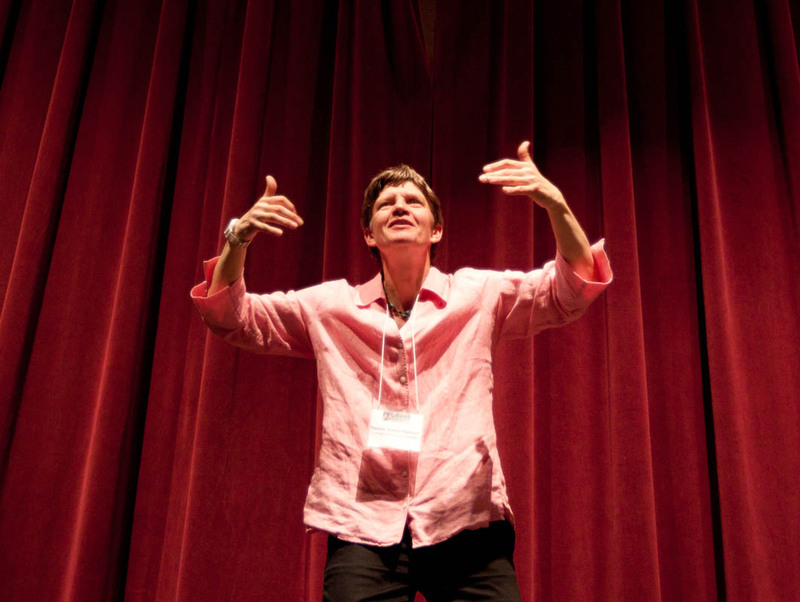 Donna Jo Napoli opened the event, thanking Swarthmore College and Cooper Foundation and the Deaf community for supporting the festival. She ended up getting everyone to engage in what was essentially a group-hug of 211 people. Richard Carter opened, with his dramatic and emotional Make-up Theatre, thought-provoking Abstract Art, and finally treated us all to the wicked and heart-warming Owl Interpreter. Donna Williams was up next with her poem on identity Who am I? and two new poems My New Cat, adopting a deaf kitten, and Red and Green, showing her battle with a cold virus in terms of a fierce boxing match. Then Debbie Rennie, dressed up in a wonderful high-necked lace collar and long late-Victorian-style black dress, performed with eye-catching energy and movement. Her offerings included one against oralism’s devastating theft of childhood, one on a deaf woman who narrowly misses all sorts of disasters that happen right by her but she never hears them and curses her bad luck when she misses the bus and a final powerful piece about the murder of a man in front of his young son. In the second half, John Wilson performed From the Depths, comparing the destructive effects of oralism on the deaf community with the destruction of whaling and an entertaining new take on the traditional signing ‘Tree’ motif about a Christmas tree that discovers life holds many surprises. Flying Words Project wowed us all with their energy and lively timing in poems including Four-arms Language, and Made in the USA, about Chinese sweat-shop industries before finishing with Double-Twinkle about the birth of a man’s first baby. Paul Scott’s Blue Suits, showed how a poem from one country can be effectively transferred ‘across the water’ to be read more abstractly and generally. While referring to Mrs Thatcher and Diana, Princess of Wales it encompassed any women who become successful through marriage or career and then lose it all. His Macbeth of the Lost Ark left the audience with the usual thrill of decipherment and he finished with his new composition I know who Stole my Heart – addressing thoughtless destruction of precious things by powerful people. Richard Carter closed the show with Fashion Times, which is a good one to have as a dish of petit fours – a sweet ending to such a rich feast of the hot, bitter, sweet and sour poems. Sunday morning’s discussion of the poems packed out the Wister Room in the Scott Arboretum, so that even the interpreters ended up sitting on the floor while the poets took turns to discuss their work from the night before. In the Q&A session, they returned to the topic of accessibility and translation of signed poetry, touching also on ideas relating to emotion and embodiment. This event, too, was attended by a good mix of students, faculty, visitors from the general public and members of the Deaf community. The formal session lasted 90 minutes but the brunch event afterwards went on for over an hour, as poets and the audience discussed and shared more ideas. By 12.30, though, most people were gone and we were all left to savour the memories. Saturday’s workshop was well attended. Here’s New York based ASL poet Douglas Ridloff performing his work ‘Transients’ at the end of the session. Richard Carter takes a bow after performing to a packed hall at Swarthmore College at the Saturday night performance, photo by Congwen Wang. There are more photos on the Signing Hands Across the Water Facebook wall. Congwen Wang’s photo shows John Wilson, Debbie Rennie, Peter Cook, Richard Carter, Paul Scott and Donna Williams as they arrive at Swarthmore College. 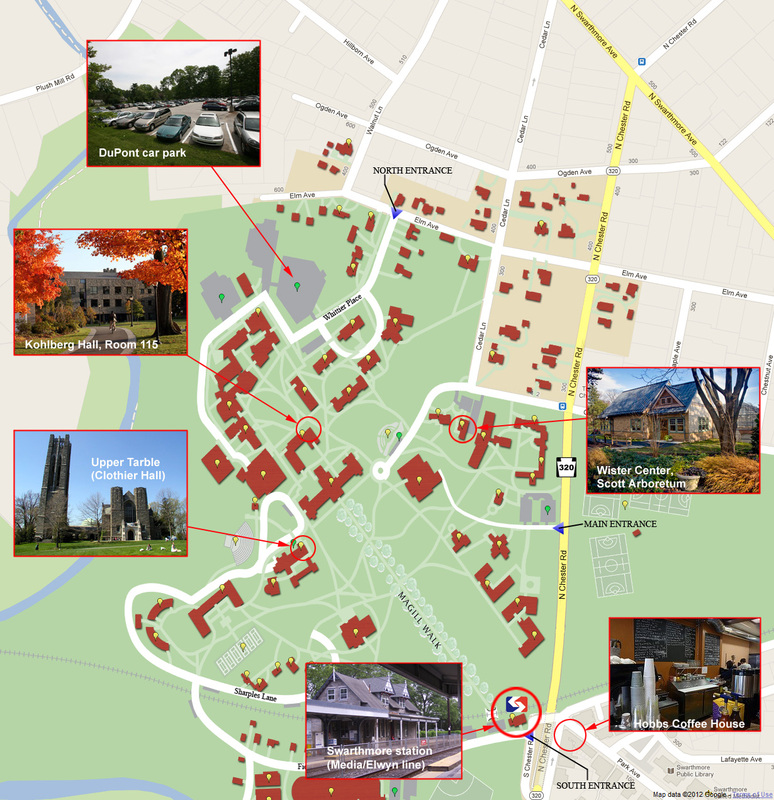 There are three venues on the Swarthmore College campus that the Festival will use and they are shown on this campus map. Upper Tarble, which is where the Conversation, the Workshop and the Performance are being held, is upstairs in Clothier Hall, this is the building that looks like a small church, which doesn’t have a tower. Kenny Lerner’s additional session is to be held in Kohlberg Hall, in Room 115, on the ground floor. Click the map to see more detail. The Sunday morning Panel discussion will be held in the Wister Centre in the Scott Arboretum, just above and behind the McCabe Library. The DuPont car park and the SEPTA railway station are also marked. From the station, look up towards the college buildings and Upper Tarble is visible on the left. Hobbs Coffee House is a nice place to enjoy a coffee, that’s opposite the station in Swarthmore itself. Vicky’s Diner is just around the corner for breakfast and lunch, another good place to eat lunch is Occasionally Yours opposite. The Swarthmore Co-Op also just around the corner from Hobbs, sells good sandwiches, coffee and groceries.